(Nanowerk Spotlight) The color of metal colloids is highly dependent on their size and therefore being able to control the size is very important to tune the metal colors systematically. By controlling the wavelength of optical resonance of metal nanoparticles and their composition, researchers in South Korea have found a way to fabricate various colored metal colloids both easily and reproducibly. These findings could be very useful for biological assays. The deposition of metal nanoparticles on the surface of nanospheres gives rise to significant changes in the optical properties. Compared with originally colorless polymers, metal-coated polymers turn to yellow or red, depending on the components of the deposited metals. This then makes them useful in biological sensing applications such as contrast agents, blood flow cytometry or surface-enhanced Raman scattering. To control the color of metal colloids, numerous researchers have tried to fabricate different sized and shaped nanoparticles using various metals. They succeeded in synthesizing various colored metal colloids by controlling the size, shapes (spherical, cube, rod, triangle, prism, etc) and geometry (core/shell, hollow, etc) ot the particles. However, they need different chemical reaction conditions to synthesize different colored metal colloids. 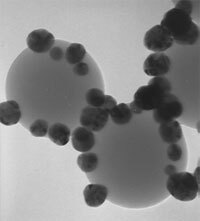 One of the disadvantages of current approaches is the fact that it is very difficult to synthesize monodispersed metal colloids on a large scale. The production yields are also very low. In contrast to the previous approaches, researchers at the Korea Research Institute of Bioscience and Biotechnology (KRIBB) suggest a method that is very easy and reproducible. "We can control the color of metal colloids systematically by just using the wavelength and intensity multiplexing of three different colored metal nanoparticles" Dr. Bong Hyun Chung, Director of the BioNanotechnology Research Center at KRIBB, explains to Nanowerk. "We just need three colored metal colloids (blue, yellow, red) that can be easily fabricated by simple water-based chemistry. By controlling the wavelength of optical resonance of metal nanoparticles and their composition, we can fabricate various colored metal colloids both easily and reproducibly." In a recent paper, titled "Multicolor nanospheres fabricated by in situ transformation of metal nanostructures on the surface of polymer spheres" Chung and his colleagues describe how the optical properties of polymer nanospheres were tuned by in situ transformation of metal structures on their surfaces. The paper was published in the June 27, 2006 issue of Nanotechnology. In the experiments of the KRIBB researchers, silver nanoparticles deposited on polystyrene nanospheres were transformed into metal hollows made of gold/silver alloy by a galvanic replacement reaction. The metal hollows made of gold/silver alloy were finally changed into solid gold nanoparticles by the additional treatment of chloroauric acid. Through the transformation process, the optical resonance peak of metal-coated polystyrene (PS) nanospheres was tuned in the 410 to 820 nm region. "The colloidal stability of fabricated particles should be enhanced by suitable surface modification" says Chung. "We can improve the stability of metal colloids by attaching biocompatible polymers such as PEG (polyethylene glycol) or their derivatives. Although gold metal nanocolloids are known to be biocompatible and non-toxic to the human body, systematic research is required before the direct applications of the metal nanocolloids in humans." Describing the practical applications of multicolor microspheres coated with metal nanoparticles, Chung lists a number of possibilities: substrates for surface enhanced Raman scattering (SERS); multiplexed optical barcoding; optical contrast agents; photonic crystals; colorimetric detection; flow cytometry; and cryptography. In addition, multicolored metal colloids can be used as color pigments because of the strong and non-bleaching optical properties of metal nanoparticles. Chung states that they have recently filed two patents in relation to their current research. Development of new sensing platform technologies based on metal nanoparticles is a promising area for future research. "However" cautions Chung, "due to the potential applications of metal nanoparticles inside the human body, research on the toxicology of such metal-based nanoparticles is a necessary requirement for future research."